Firstly this is a temporary work around for FCPX users as Sony hope to have a working plugin for XAVC Long G in the near future that will negate the need for this browser. 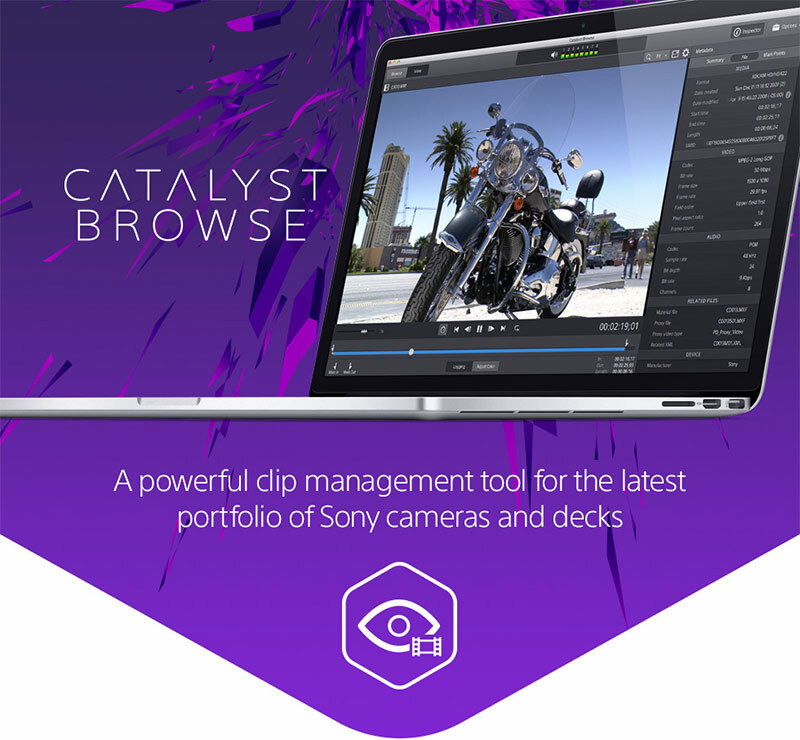 Today Sony released their powerful management tool “Catalyst Browse” which converts XAVC footage into ProRes and other formats. 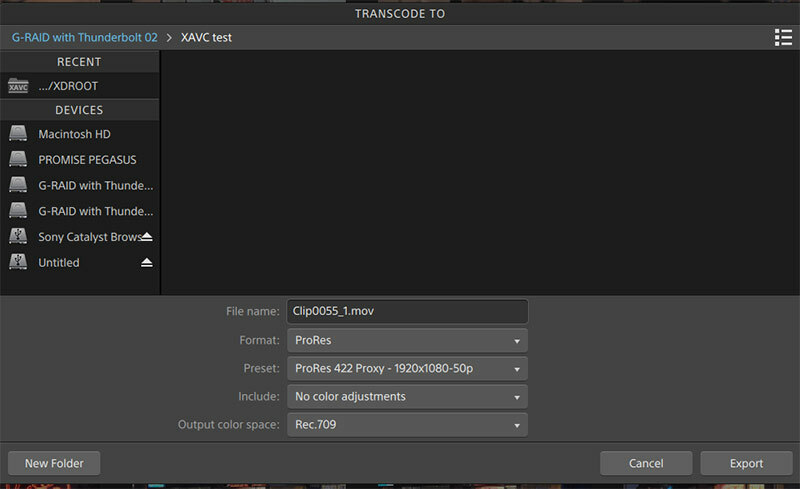 Finally I get to choose my XAVC files (PXW-X70) via the computer and with this nifty application transfer them to Apple ProRes. As you can see you can transcode to .mp4, DPX, ProRes and XAVC, I can only presume the XAVC version will be conversion from another Sony format ? 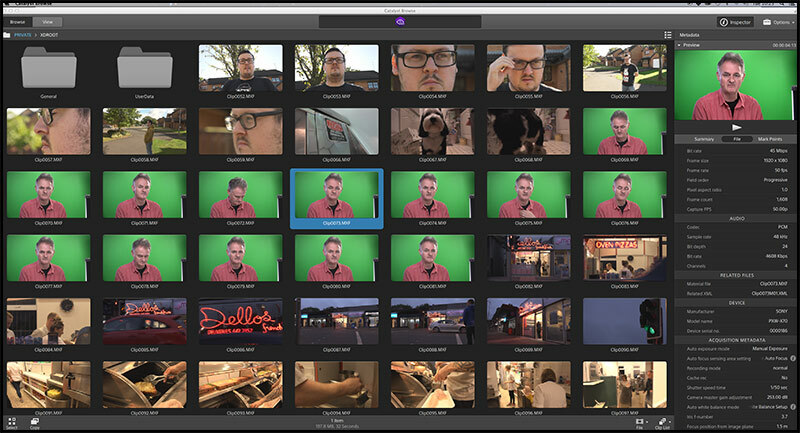 Exporting to ProRes gives you the perfect option for FCPX. 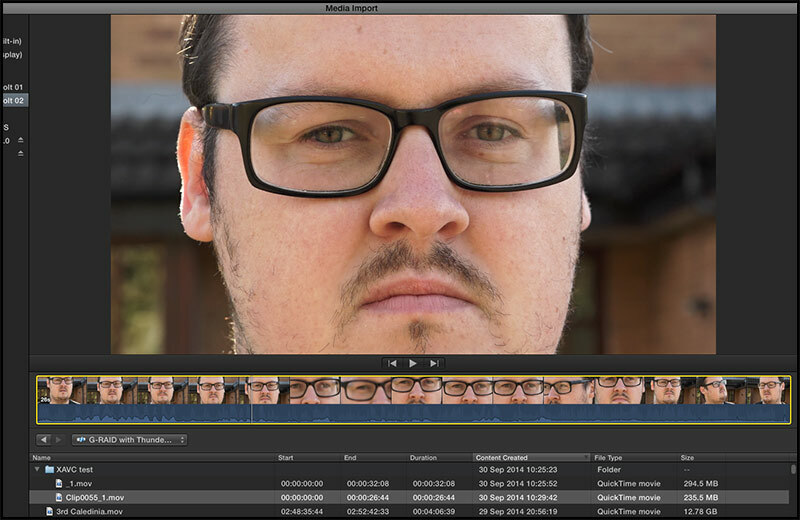 Here is a test shot I filmed yesterday now in all its full HD glory just about to be imported into FCPX…fantastic. You may want to download the “Catalyst Browse” for yourself remembering you will need to register with Sony before it allows you to download it for real…in other words this link takes you to a Sony download page where you can choose WIN or MAC versions…when you press download it will ask you to sign in or register, just fill in your details, sign in and press download again. UPDATE Friday 3rd August : Sony reply to my email… “Some people have tried to batch capture from Catalyst Browse but the Transcode button greys out” Reply “Currently there is no batch transcode on the catalyst browse, but the team have already requested this as an additional feature.” “As I mentioned before we continue our close work with Apple on FCPX integration”. 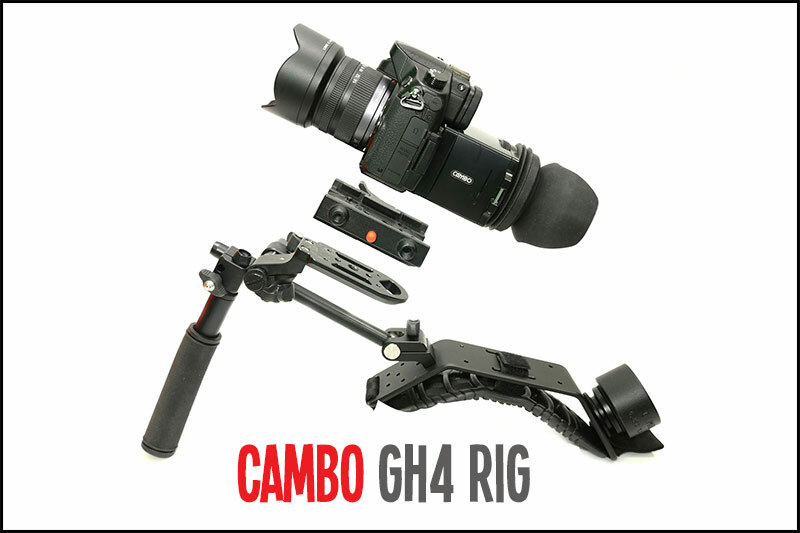 I have had this rig for a few weeks and is perfect for run and gun shoots, the Cambo GH4 Rig v2 comes with the longer camera plate and 4 screws. This allows you to attach the Manfrotto quick release camera adapter (not included) to the rig via the 4 screws provided making a solid connection for video work. You can unscrew the weight at the back of the rig if you feel its back heavy. Although its called the GH4 Rig you can also use it with various other cameras in this case the Sony A7s though I do recommend using a loupe to keep daylight off the LCD. 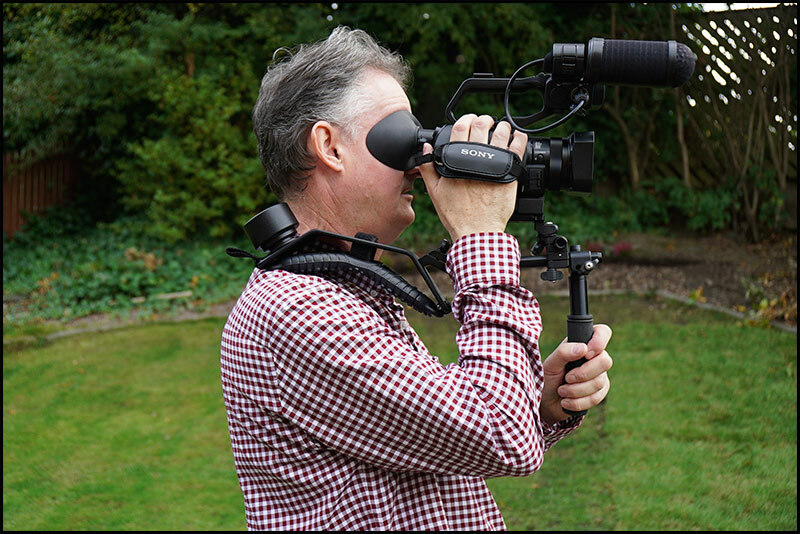 Smaller video cameras like the new Sony PXW-X70 can also benefit from the Cambo GH4 Rig v2 especially using the quick release Manfrotto plate. Cambo rigs are not only solid but very practical and easy to setup, everything locks into place and made with the greatest of care. The rigs are made in the Netherlands and can be bought from various resellers like Production Gear. 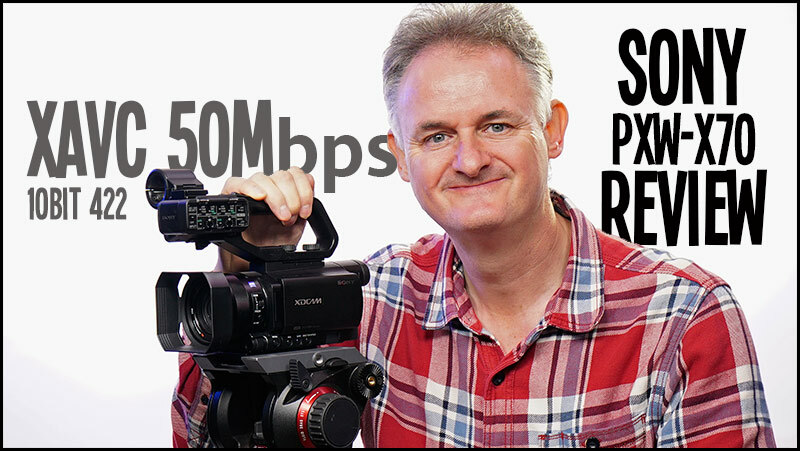 I have put together a 3m 30s video to let you see the capabilities of the Sony PXW-X70. Having XAVC 10bit 422 at 50Mbps onto a fast SDXC card produces some stunning footage only seen from shoulder mounts at 5x the price of the X70. 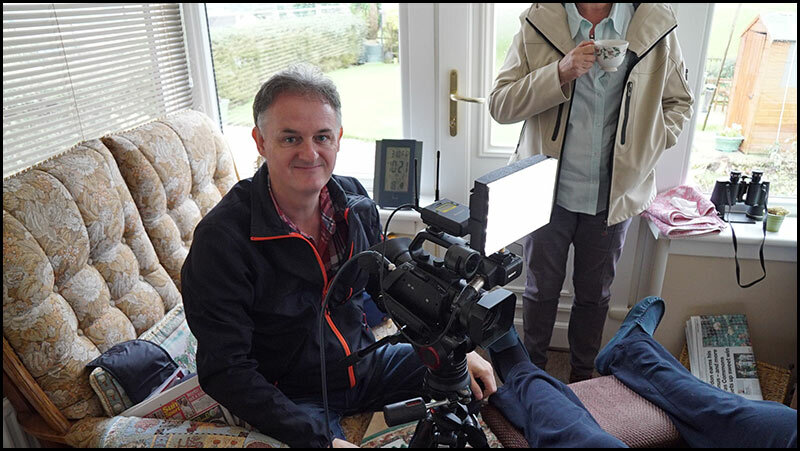 All the green screen was shot with the X70 as were the flowers and chip shop footage. The 1080 50p footage was taken into FCPX via Ultra Studio 4K. The PXW-X70 soaks in the light, thank goodness for the ND filters, this is a camera you need to work with but I did find setting it in full auto mode for a couple of shots did a fine job. You can work up to 15dBs with this camera without any discernible noise, for the money its a no brainor. Today (Friday 3rd October 14) I was filming an interview with a very ill patient for a major NHS job that we are producing and the quality of the pictures are stunning, I am blown away with the picture quality from the X70 and I love the ability to view my HDSDI output to my Sony PVM-740 OLED monitor. This was the perfect scenario for the smaller camcorder to capture 1080 50p pictures in a tight space. 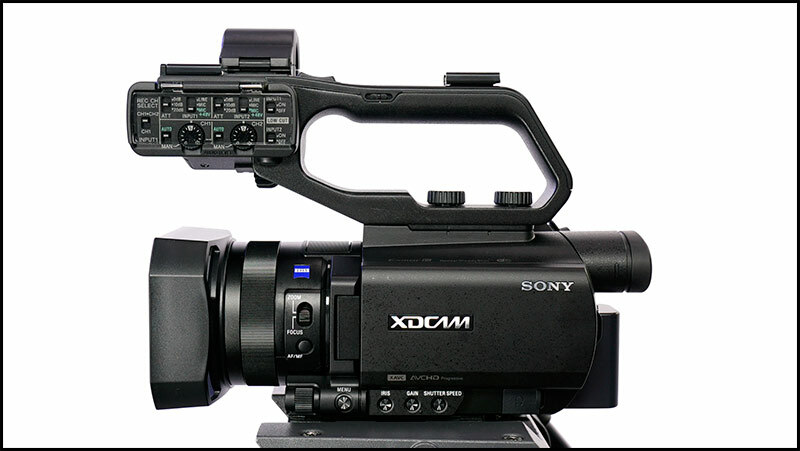 The PXW-X70 comes with a second cold shoe that you can mount onto the rear of the handle, very useful for my Sony hybrid radio mic UWP-D11. 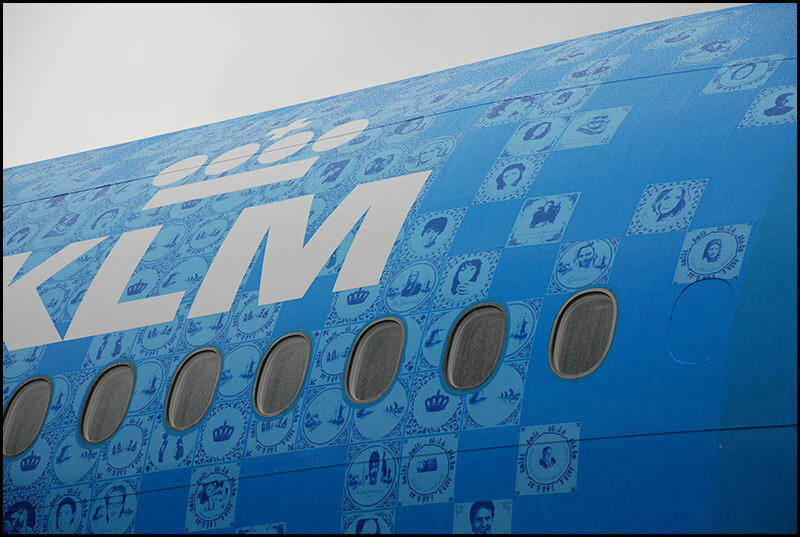 Every so often a well produced advert comes along and the KLM is no exception, this is a great PR add for the airline and I would be interested to hear from the production company with some background information. 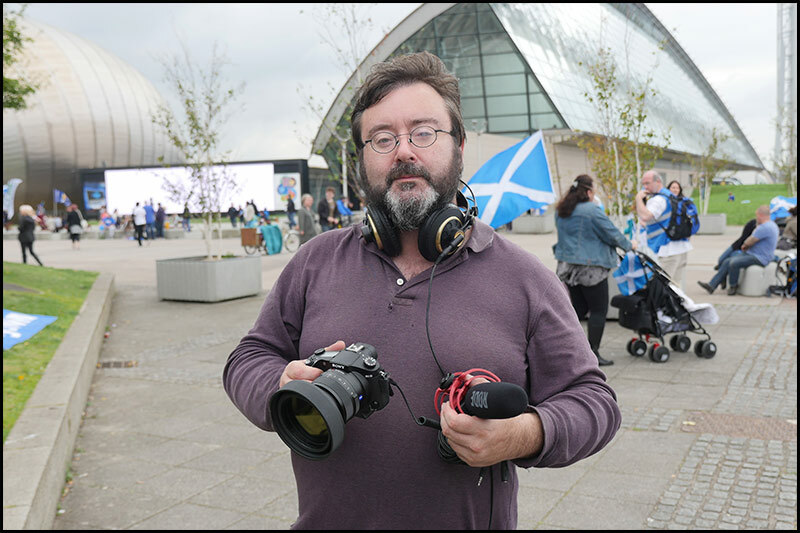 The Sony PXW-X70 arrived during polling day, the 18th of September, as you can imagine other things were on my mind that day so it wasn’t till the next day that I had a good look over the camcorder and spend some time filming with it. In XAVC mode you get various flavours from 720 50p 50Mbps to full HD 1080 50p 50Mbps, to 50i and 35Mbps to save on card space. The cards I am using are Transend SDXC 64G class 10, speed 3 (R95-W60Mbps) anything else like the SanDisk class 10 speed 3 (45Mbps) won’t allow XAVC recordings. This is the major bonus for me using fast SDXC cards at about £30 a pop you are not having to fork out for expensive £329 64G XQD cards. I have been using these cards with my 4K GH4 for a few jobs now without any problems. Its heavier than I was expecting and slightly fatter than my previous NX-30 but someone in Japan has been thinking carefully about this camera and packed a ton of features into a wee body. In XAVC 50Mbps mode you now get 10bit 422 footage which is stunning and very noiseless. 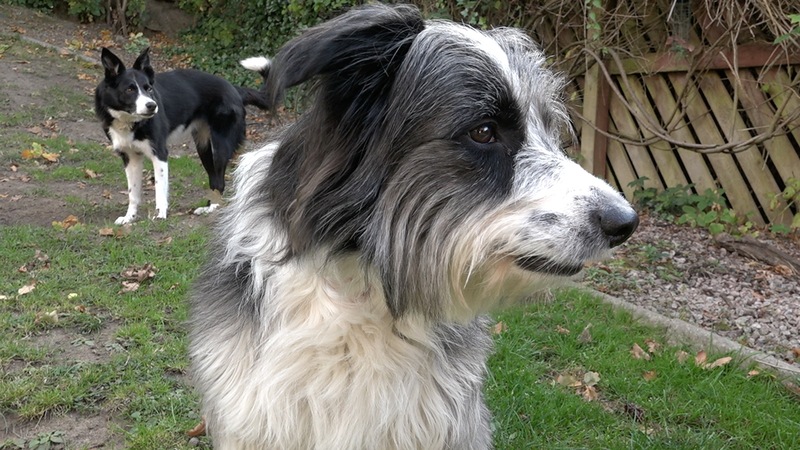 A shot taken at 0dB’s if you double click you can view the 1920 x 1080 10bit 422 JPEG from the timeline. All the main switches are on the side of the camera and as usual pressing the Thumbnail button gets you into playback mode, the headphone socket is also on the side now (green socket). I went up to view a local chip shop I have in mind to get some run and gun shots and took the camera with me…this little monster can shoot 18dBs with virtually no noise. 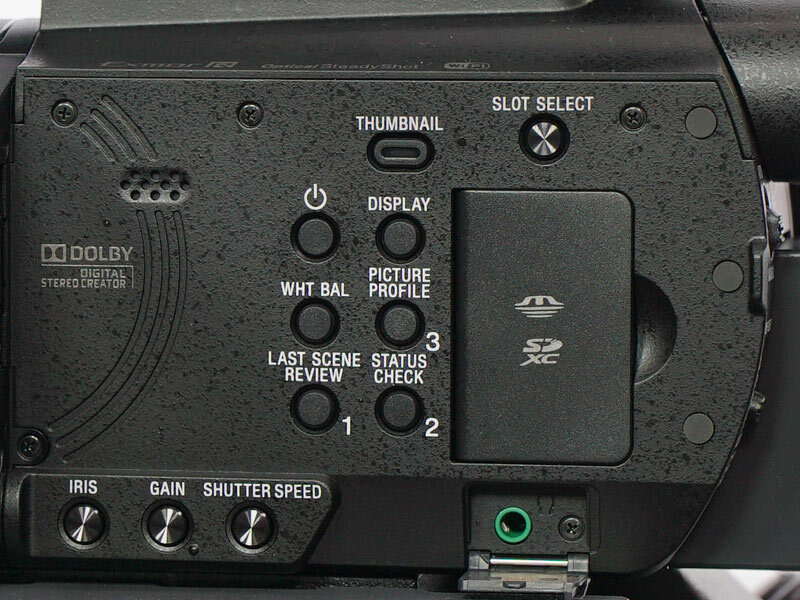 Setting your white balance is in my opinion slightly convoluted in the PXW-X70 you have to press the WHT BAL button (seen above in main body pic) and finnish off the WB in the camera menu under “WB SET”. The Zeiss 12x optical zoom starts at f2.8 which is disappointing as its not a constant aperture lens, a feature I would have gladly paid extra for. Very sharp and lots of detail especially in XAVC mode. The good thing about a 4K ready camera is you get sensors and glass that exceed HD and therefore give you cracking HD pictures. Headphone volume is another strange menu driven task under the wee audio ikon, its just called “VOLUME” then you can raise or lower your headphones. Like previous smaller cameras like the HXR-NX70 the camera powers up by opening the LCD unlike the NX70 this has an HDSDI socket and a full size HDMI socket. The wee joystick beside the start /stop button is in the perfect position when flicking through the menu. So far…The pictures from this camera are some of the punchiest, noiseless 10bit 422 I have seen, this camera was bought as a run and gun compliment to my Sony A7s (more about that in another post). 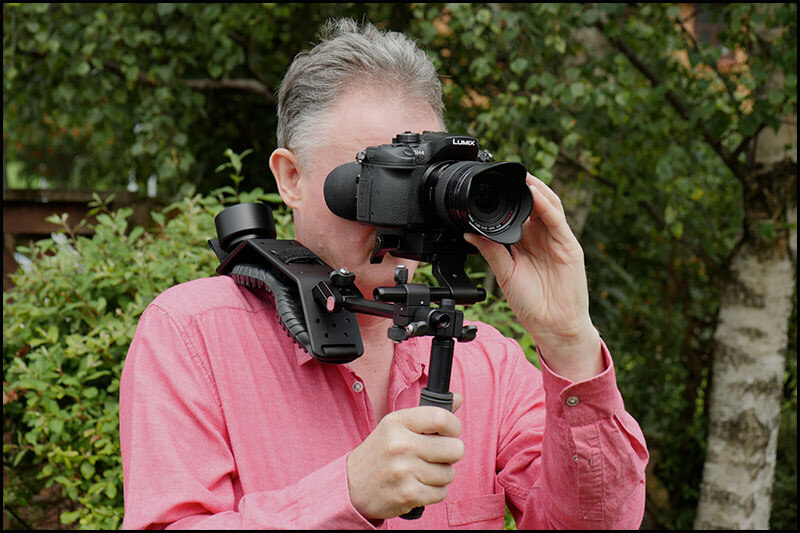 Sony are pulling no punches with this camera to a season’d professional who prefers shoulder mounts this camera will slip by them…if you need a camera capable of green screen work. news and corporate this will fit the bill, the only feature I can’t find on the X70 is syncro scan , a small detail. Sony do not give you any microphone or charger with the X70 but as I already have the AC-VQV10 double ActiFORCE “V” charger its no great shakes. Another function missing is Lanc control which is surprising …admittedly you can use Wi-Fi or NFC to remote the camera but not having a simple Lanc for a zoom control is poor. UPDATE : Sony VMC-AVM1 DOES NOT CONTROL the Lanc on 3 controllers that I have this micro USB seems to be for video/audio only. 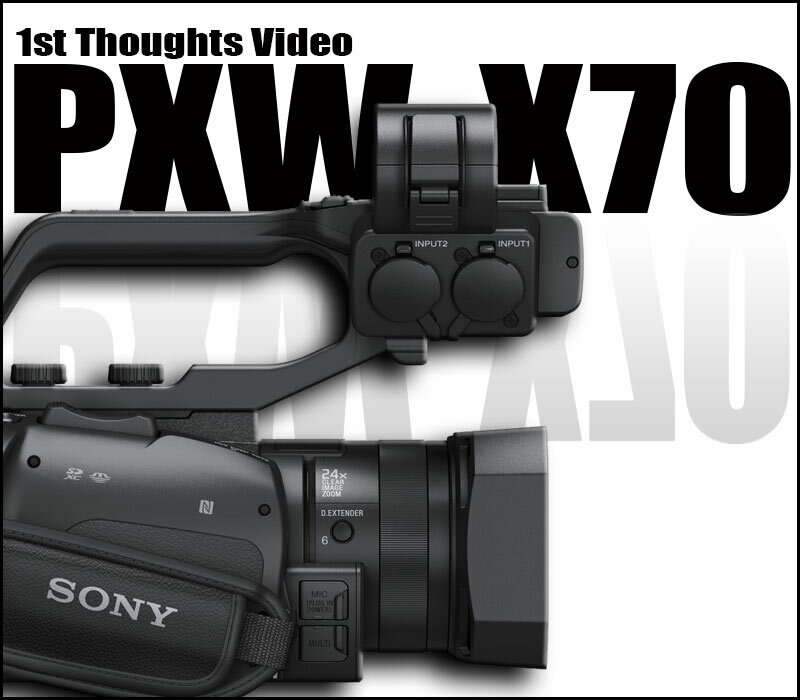 The PXW-X70 really benefits from being 4K ready, I saw this with the Sony PXW-Z100, having a 4K sensor, 10bit 422 engine gave you some stunning HD footage and the X70 is no exception. A WORD OF WARNING : If like me you are using Apples FCPX you may have a problem…I have not got to the bottom of this yet but FCPX should be able to ingest XAVC footage, I have tried the X70 in many XAVC frame rates with no success. A more sinister problem has occurred which I have not got to the bottom of is when you pop the SDXC card into the card reader and try to get FCPX to look at the footage you end up with a corrupt card, as can clearly be seen above. Sony do supply a plugin for XAVC called PDZK-LT2 for mac but offers no solutions for my problem. So its not just me, I can get the footage into FCPX via my Ultra Studio 4K and Ultra Studio Express software but I bought this camera for its 10bit 422, cracking pictures and dual card system and the ability to transfer quickly from card for news use. 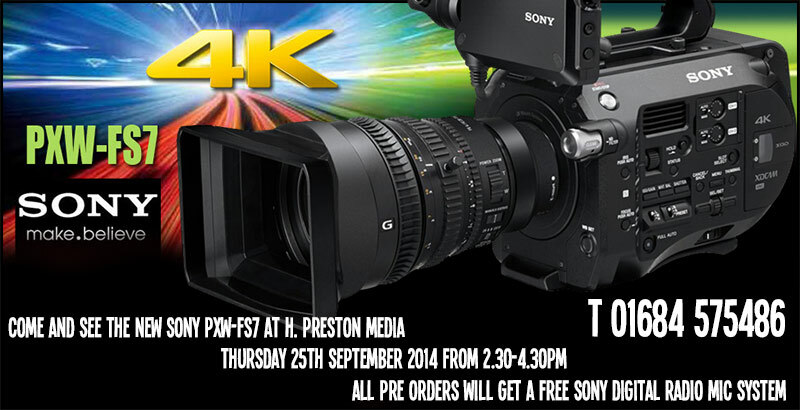 Sony are on the case and hope to have a workaround by the 31st of September 2014, I will keep you posted. I will post some footage when I get more time. 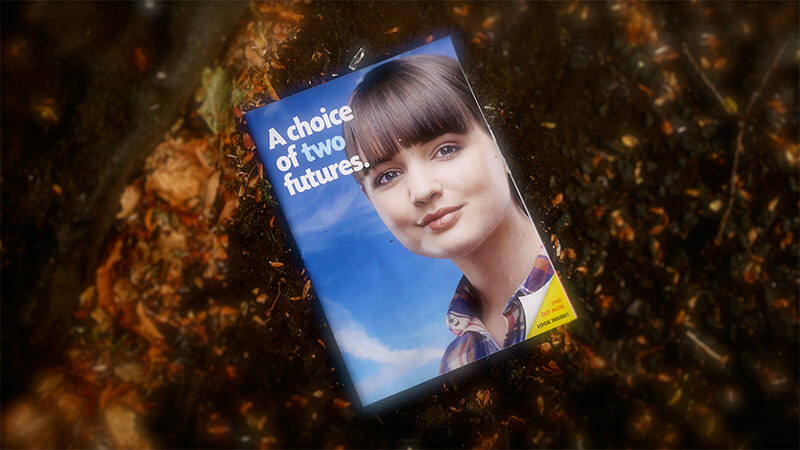 One of the most important days in Scottish History has arrived ! 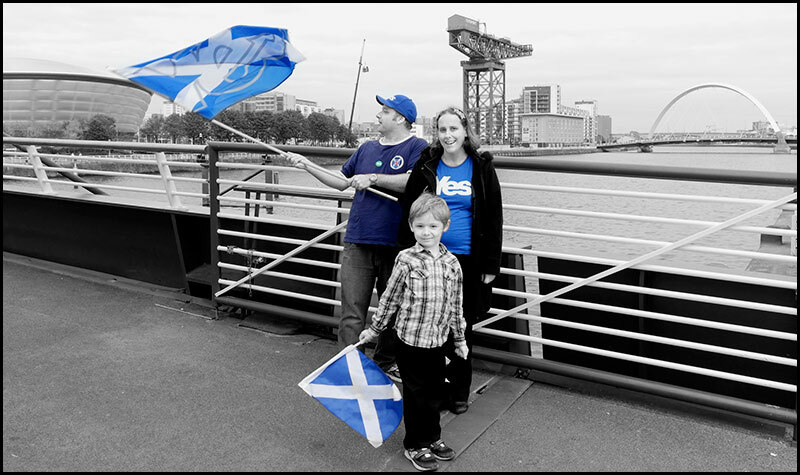 You would have to have been at Mars if you were not aware of the Scottish Referendum, this is a typical Glasgow YES family overlooking a typical Glasgow view. 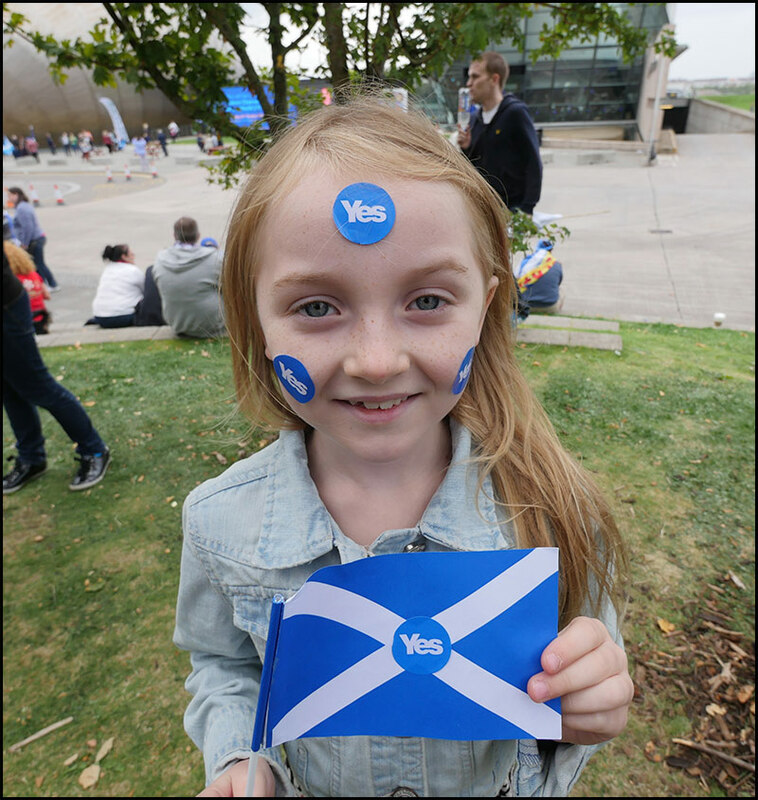 I love this on two accounts firstly asking her father if I could take the picture and the fact that todays vote will affect this wee girls future a lot more than myself. 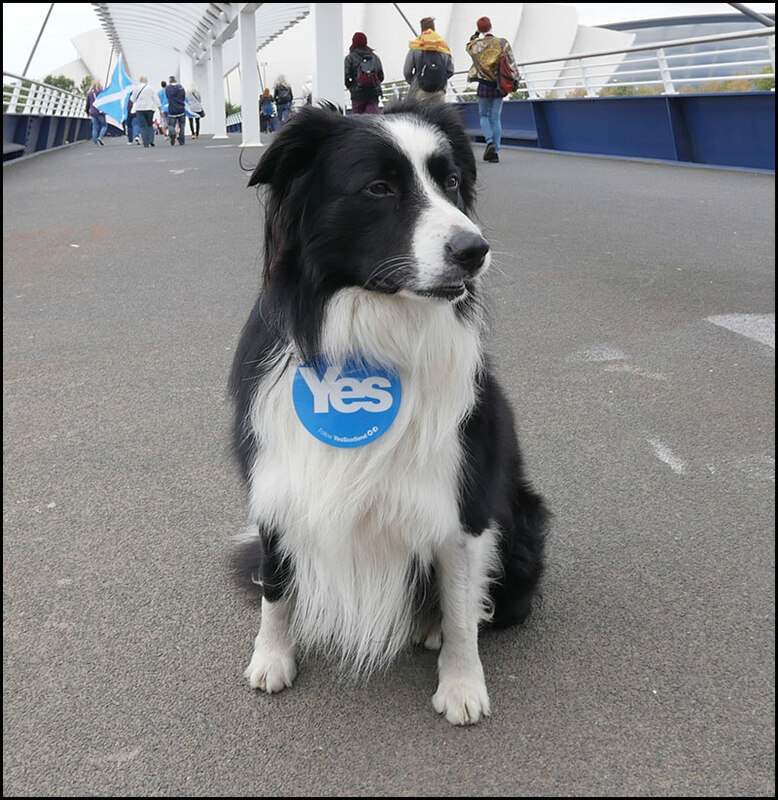 As a big dog lover and collie owner I could not resist this picture. Lastly I bumped into my good friend Tim who was filming with his new Sony RX10. The 4K Photo is a new way of photography that Panasonic is proposing. It encourages users to capture the spur-of-the-moment in high resolution 4K photo by cropping out a designated frame out of the 4K video. With the new firmware, it is easier to get a 4K photo by using the 4K Photo Mode. Once selecting the 4K Photo Mode, recording format / picture quality setting / brightness level are automatically set to the optimum parameters for photo shooting. Users can record high quality video either in 4:3, 3:2 or even 1:1 aspect ratios in addition to 16:9 – all can provide a still image with 8-megapixel equivalent resolution. Each JPEG image cropped out of the video footage complies with EXIF just as a normal still picture. While recording the 4K video in 4K Photo Mode, it is possible to mark the designated portion by just pressing the [Fn1] button. This can reduce postproduction work for searching the spur-of-the-moment worth cropping out. Moreover, 4K video can be recorded continuously with Loop Rec function which keeps saving the 5 newest 2-minute video files. Users can patiently wait for the perfect photo opportunity to come as long as they want keep the camera recording without worrying about the capacity of the SDXC/SDHC Memory Card*1. 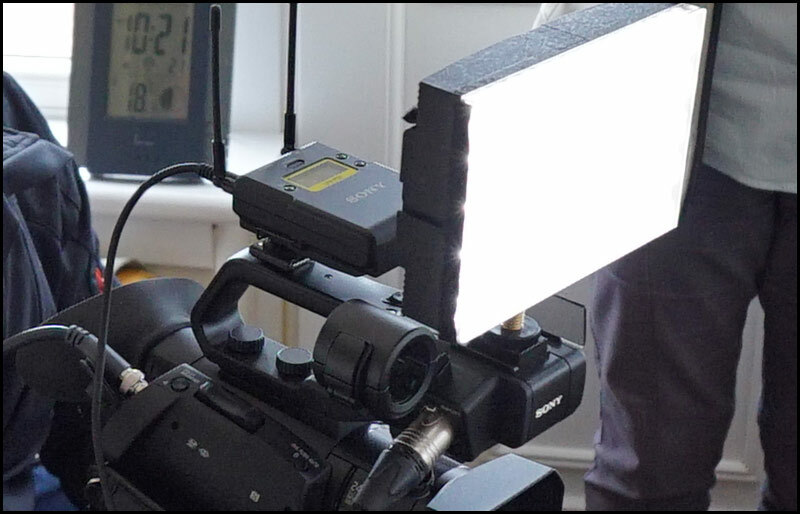 There are more functional upgrades such as the addition of 4K video recording in 23.98p (MP4, AAC) and enhancement of controllability over ISO setting or the amount of flash emission. 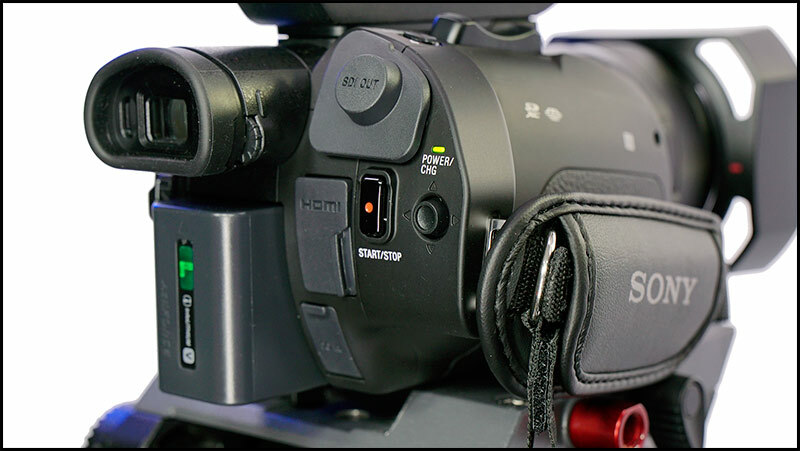 Also, the DMC-GH4 now expands its connectivity with external equipment. For example, the PC software “USB Tether*2” enables remote camera control (shooting, setting or image data transfer) by PC via USB. The PHOTOfunSTUDIO 9.5PE and Panasonic Image App for iOS/Android will also be updated to support these functional upgrades. 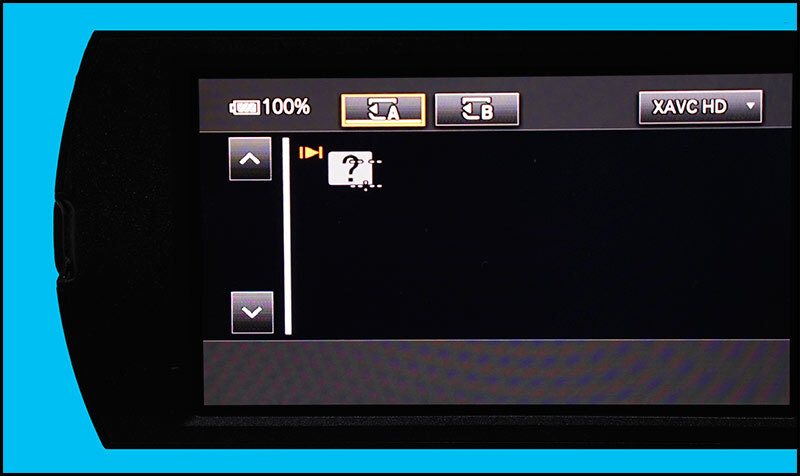 The new firmware program is scheduled to be released with more information in detail at the Panasonic LUMIX Support Site at http://panasonic.jp/support/global/cs/dsc/ in the beginning of October, 2014. Sony’s Bill Drummond from IBC 2014 going over the new range of Sony XDCAM camcorders. The Varicam HS incorporates the AVC-ULTRA family of video codecs and high speed 1080p image capture of up to 240fps*1 and features an innovative modular design. The Varicam HS 2/3 type camera head docks with the AVC-ULTRA recording module to provide the full functionality and ergonomics of a conventional production camera/recorder. 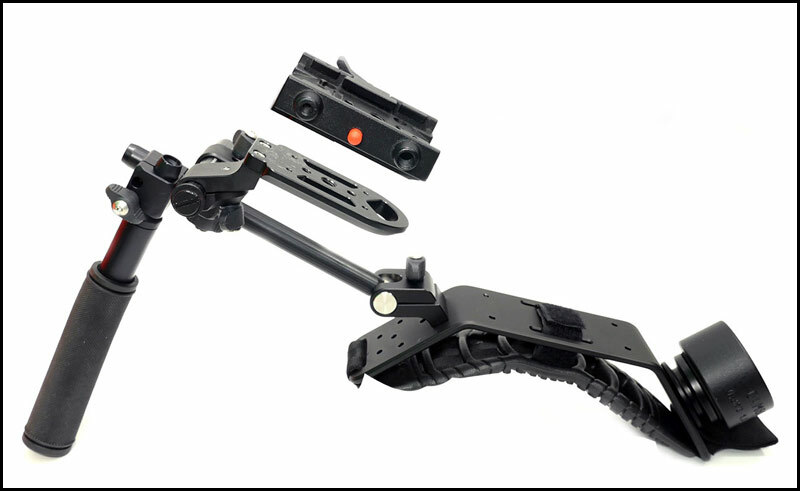 This system flexibility can be expanded with an umbilical cable between the 2/3 type camera module (AU-V23HS1) and the recording module (AU-VREC1), providing “box” camera functionality for jibs, cranes and other “remote” camera needs. This common recorder module is also interchangeable with Panasonic’s new s35mm 4K camera module (AU-V35C1), enabling professionals to switch between 2/3 type and s35mm camera heads to best suit their creative needs. The Varicam HS utilizes three newly-developed, 1920 x 1080p MOS imagers with an extraordinary 14 stops of latitude, providing full control over a wide range of lighting conditions for unparalleled 1080p native recording/operation. The camera/recorder boasts a classical RGB imager/prism system that provides equal-band full resolution colour processing for critical applications. Among the camcorder’s key features are real-time high frame rate and off-speed recording to 240fps in 1080p (using AVC-Intra Class100), plus the ability to ramp / change frame rates during record. To complement the impressive video quality, the new Varicam HS boasts 24-bit LPCM audio capabilities. Powerful yet creative image controls such as matrix, detail, gammas and a new Log recording capability allow precise, powerful creative control over image parameters. The Varicam HS will feature a range of high-quality recording formats including AVC-Intra Class100 (recording as 1080/24p, 30p or 60p format with VFR (up to 240p*1), AVC-Intra Class200 (up to 30p/60i) and AVC-Intra Class4:4:4 (up to 30p). Both AVC-Intra Class200 and AVC-Intra Class4:4:4 deliver spectacular performance in applications where image quality is the utmost consideration to produce extraordinary high-definition imagery for the most demanding documentary, sports or SFX slow-motion applications. It also includes Apple ProRes 4444 and ProRes 422 HQ*2 support for HD recording. The ProRes codec component is licensed from ATOMOS Global Pty. Ltd., which has shipped ProRes recorders for years. 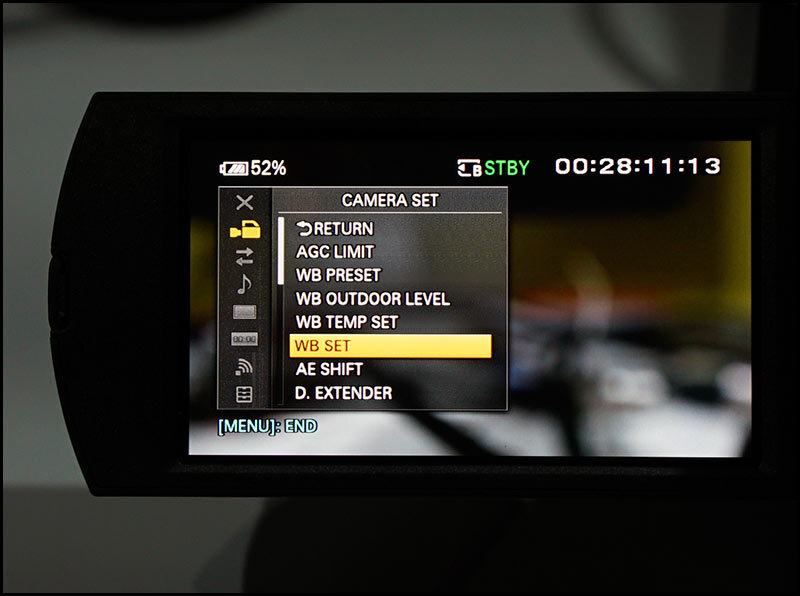 The Varicam HS adds “V-Log“ to the well-respected FilmRec and Dynamic Range Stretch (DRS) image contrast management controls. The Varicam HS will feature Panasonic’s Emmy® Award-winning Chromatic Aberration Compensation (CAC) technology to minimize lateral chromatic aberrations and dramatically improve the Modulation Transfer Function (MTF) of the optical system. Varicam HS also affords in-camera colour grading. AVC-Intra Class4:4:4 supports 12-bit recording for 1080p content, allowing file-based 4:4:4 workflows with the unparalleled ability to handle the finer tonal graduations and colour fidelity that the 12-bit format provides. AVC-Intra Class200, at twice the bit rate per frame of AVC-Intra Class100, is visually lossless, delivering studio master quality for recording network-level programming and archiving. AVC-Intra Class200 is ideal for field capture of content for film-outs; the higher quality greatly enhances colour correction processes, as well as green screen and compositing applications. The Varicam HS will use Panasonic’s new expressP2 card for high frame rate recording (frame rates above 60fps). The camera recording module unit is equipped with a total of four memory card slots, two for expressP2 cards and two for microP2 cards. The new 256Gbyte expressP2 card can record about 32 minutes of 240p 1080 HD video. The microP2 card is designed for recording HD at more typical production frame rates. Addressing the need for high-speed file exchange, the Varicam HS encodes high-resolution proxy files in parallel with higher bandwidth production formats, enabling fast, efficient offline editing. Professional interfaces include: RGB4:4:4; a 3G-HD-SDI out to support 1080/60p, an HD-SDI out for monitoring; and two XLR inputs to record four channels of 24-bit, 48KHz audio. A multi-connector facilitates docking the camera head to the recording module. In another innovative design addition, the Varicam HS boasts a removable control panel to facilitate real-time control and easy menu access when the camera is in a fixed or remote position. 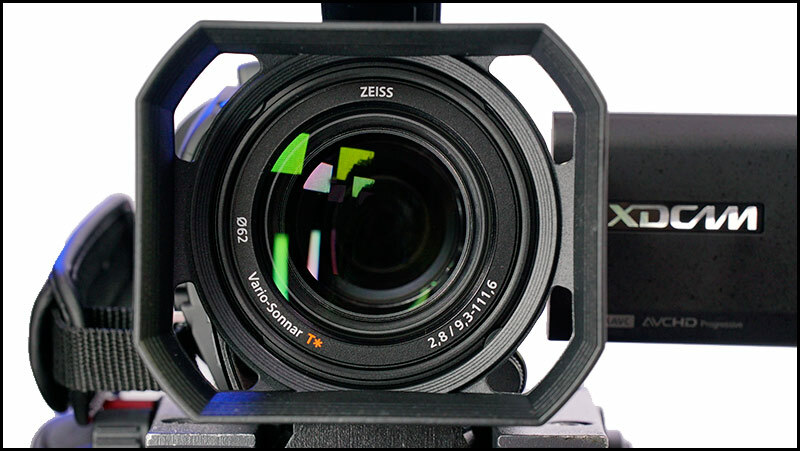 The camera’s 2/3 type B4 lens mount enables use of a remarkable variety of prime lenses and servo zooms, lensing possibilities simply not available on larger formats. The Varicam 35 4K camera/recorder incorporates a newly-developed super 35mm MOS image sensor and AVC-ULTRA family of video codecs. The new camera’s superb image handling in multiple formats including 4K, UHD, 2K and HD make it an unparalleled tool for high-end filmmaking, and commercials and episodic production as well as live 4K events. The Varicam 35 innovative design, includes the 4K camera module unit (AU-V35C1), recording module unit (AU-VREC1), which is also interchangeable with Panasonic’s new 2/3 type camera module unit (AU-V23HS1). Enabling professionals to switch between s35mm and 2/3 type camera heads to best suit their creative needs. The Varicam 35 utilizes a new Panasonic super 35mm MOS sensor for 4096 x 2160 (17:9) 4K image capture; this imager when combined with the AVC-ULTRA codecs for 4K enables very manageable and practical 4K production file sizes. The new imager boasts an impressive 14+ stops of latitude, and faithfully captures high-contrast, wide dynamic range imagery without compromise. Powerful colour management capabilities provide a much extended colour gamut for impeccable image fidelity, and permit support for an Academy Colour Encoding System (ACES) workflow for full fidelity mastering of original source material. Among the camera/recorder’s top-level production features are real-time, high frame rate, variable speed 4K recording up to 120fps*1, proving the capability for master level 2K/FHD recording; and advanced workflows with parallel simultaneous 4K/ UHD, reference 2K/HD and proxy recordings for in-camera on-set colour grading and monitoring / editing ease. The camera also features a newly-developed OLED electronic viewfinder (EVF) with optical zoom functionality. 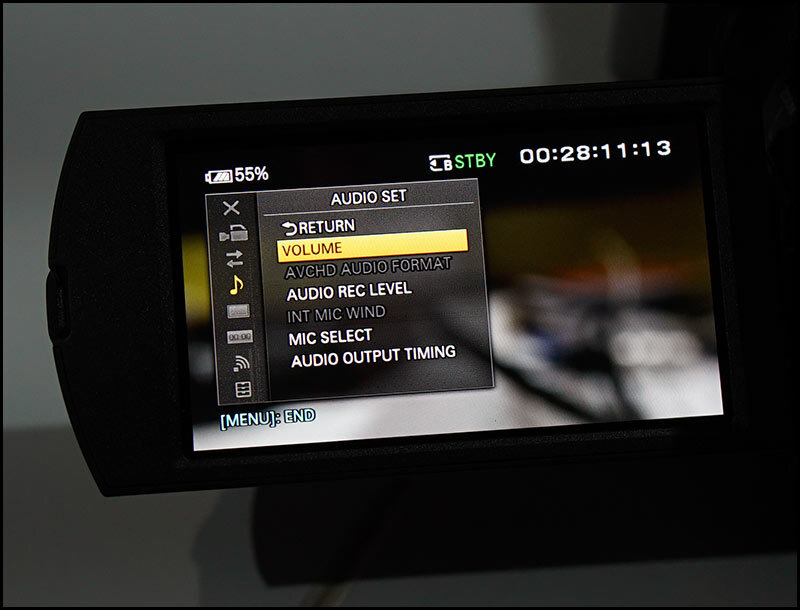 Lastly, 24-bit LPCM audio is added for in-camera audio master recording. The Varicam 35 will deliver an unprecedented breadth of recording formats, including 4K and UHD in AVC-ULTRA 4K, and 2K and FHD in AVC-Intra 100/200*2. 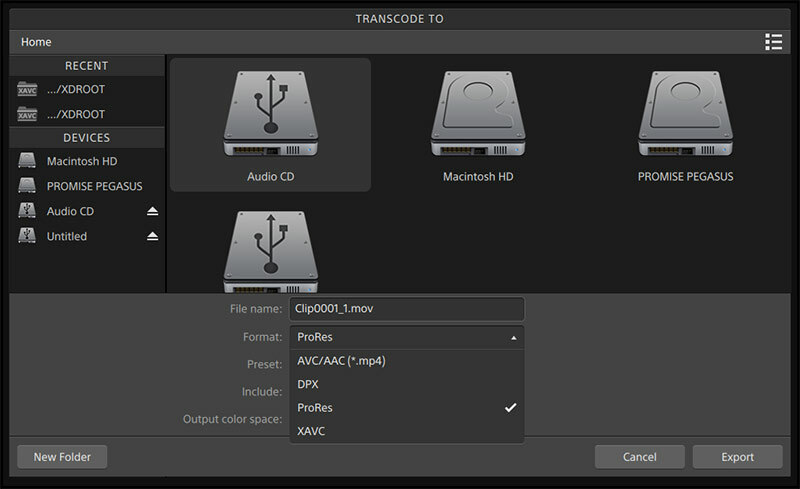 Addressing the need for high-speed file exchange, the camera encodes proxy files in parallel with 4K and 2K production formats, enabling fast, efficient offline editing. It also includes Apple ProRes 4444 and ProRes 422 HQ*3 support for HD recording. The ProRes codec component is licensed from ATOMOS Global Pty. Ltd., which has shipped ProRes recorders for years. 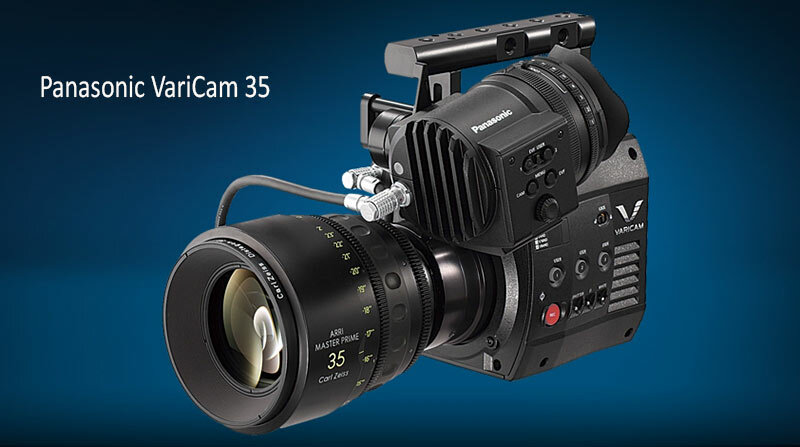 The Varicam 35 will use Panasonic’s new expressP2 card for high frame rate and 4K recording. The camera is equipped with a total of four memory card slots, two for expressP2 cards and two for microP2 cards. The new expressP2 card can record up to 130 minutes of 4K/24p content. The microP2 card is designed for recording HD or 2K at more typical production frame rates. Professional interfaces include: 3G-HD-SDI x4 for 4K QUAD output; 3G-HD-SDI x2 for RAW output; an HD-SDI out for monitoring (down-converting from 4K); and two XLR inputs to record four channels of 24-bit, 48KHz audio. A multi-connector facilitates docking the camera head to the recording module. In another striking design innovation, the Varicam 35 boasts a removable control panel to facilitate real-time control and easy access when the camera is in a fixed position. The Varicam 35 features a standard 35mm PL mount. 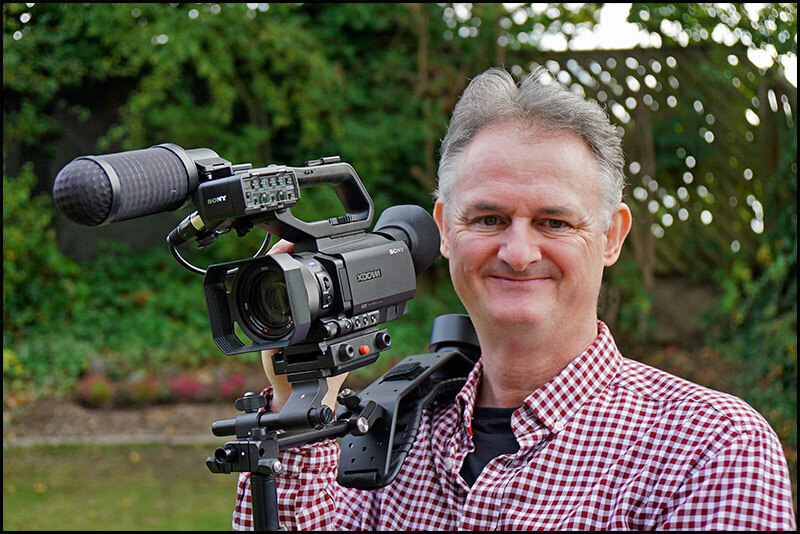 What a start to IBC 2014 with Sony pulling the FS7 out of the hat…this is the 4K/HD camcorder of 2014…poor Panasonic with their VariCam just coming to market having to fight off the FS7 is going to be a major headache for not only them but Canon. Who in their right minds will buy a C300 or C500 with this £8000 Sony FS7 on offer and that includes the 28-135mm f4 servo zoom lens. For anyone who did not watch the live stream from Sony this morning the Sony F5 is to be FW updated to allow 4K internal recording which is no surprise after announcing the new FS7. Matt Davis “Sony won it. They aced it. 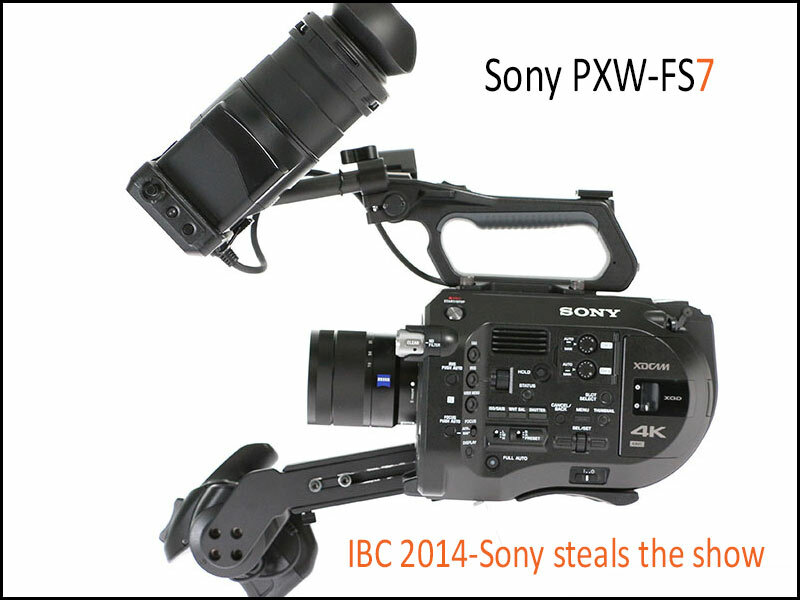 The S35 sensor e-Mount PXW-FS7 is the ‘camera of IBC’. What isn’t there to love? 4:2:2 10 bit internal recording at HD and 4K, 180fps for HD slomo, great ergonomics, every element of camera ownership carefully throughout. So sorry, JVC and Panasonic – 1/3″ sensors just don’t cut it any more. 1″ is good – 2/3″ is a widely supported format for lenses. It comes down to this: if you have a camera that does less than 2/3″ sensor (x3) and does less than 4:2:2 at 10 bit, you’re toast. 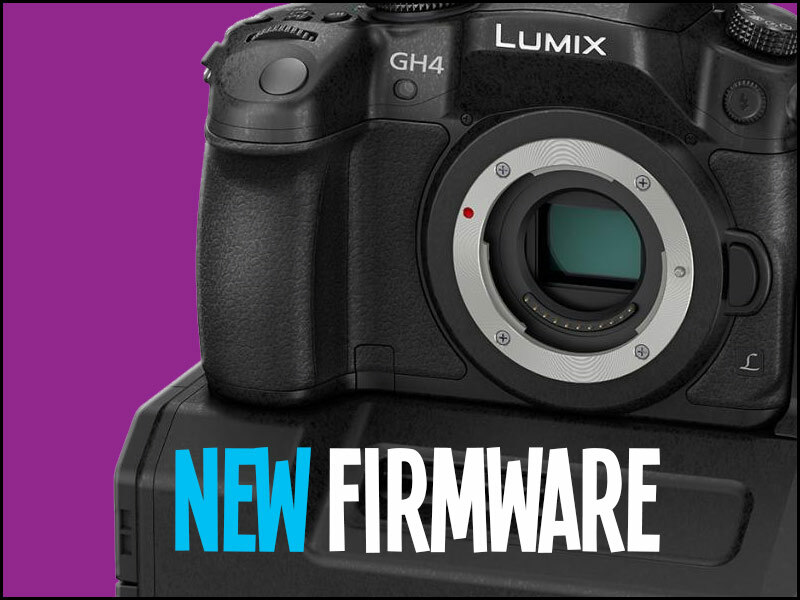 Why didn’t Panasonic put a GH4 in an AF101 body? Why is JVC mucking around with 4K on small sensor sizes? Who wants a 100 ISO camera? Canon is dangling in the wind. 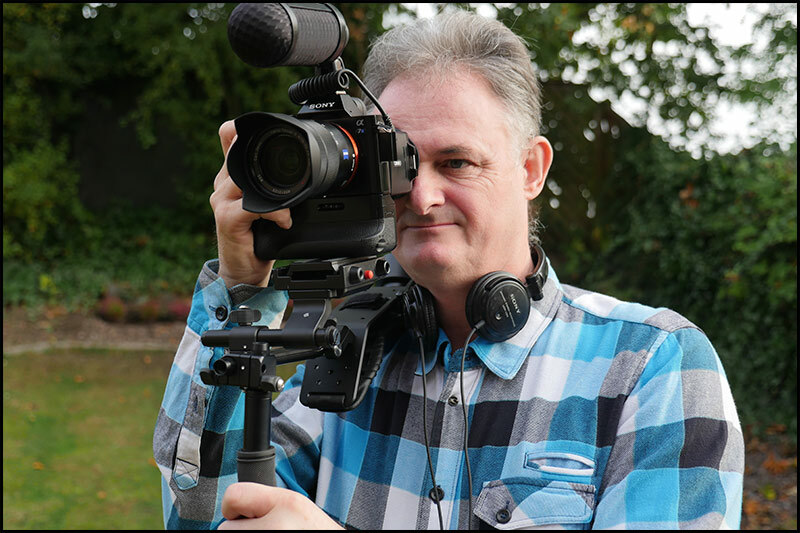 If anyone is considering a C100 or C300, they are duty bound to look at the FS7 now – for the internal 10 bit acquisition, for the 4K option, for the variety of e-mount lens options, for the superlative ergonomics – why would you not? 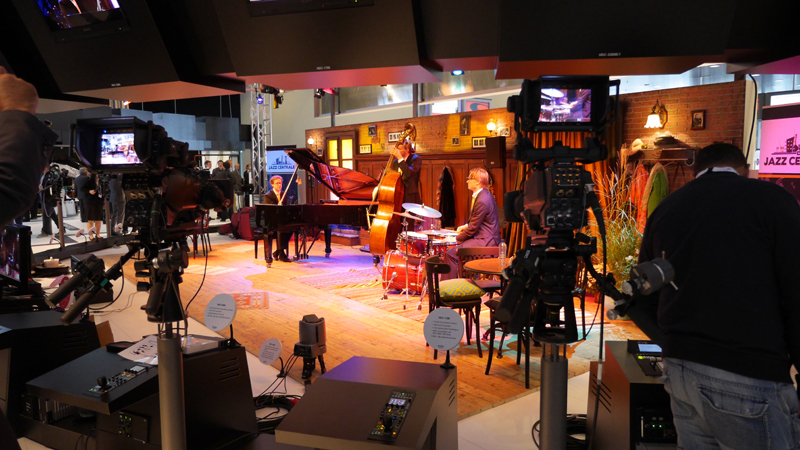 IBC 2014: News Shooter – Sony FS7 from Teradek on Vimeo.